SEATTLE — Saving orcas and salmon from extinction in the Salish Sea requires unheralded scientific research, yet the real driving force for ecosystem restoration may be the intimate, personal stories that connect people to the waterway. That was a leading message in discussions Wednesday morning, as Gov. 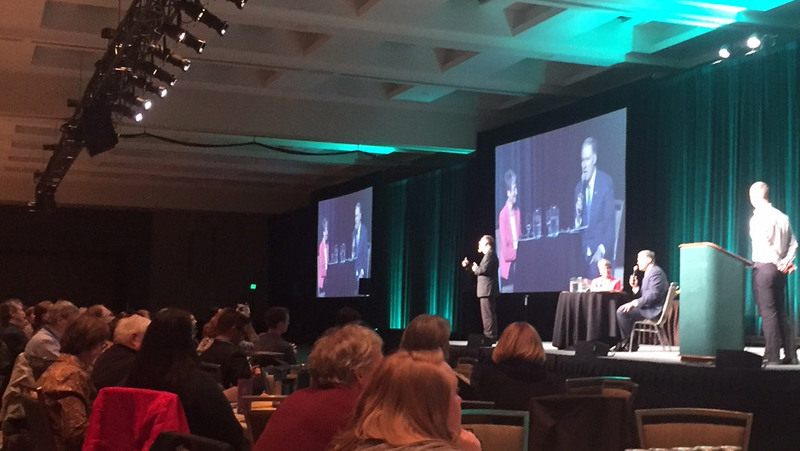 Jay Inslee and former Secretary of Interior Sally Jewell opened the Salish Sea Ecosystem Conference. The event, in downtown Seattle, attracted more than 1,300 scientists, policymakers and other people interested in the Salish Sea — the body of water that encompasses Puget Sound in Washington state and the connected Strait of Georgia in British Columbia. “Of all the things I work on in government, this is the something that is closest to my heart,” Inslee said, telling a childhood story about being out in a tiny boat with his father in the San Juan Islands. As the boat moved through a heavy fog bank, a young Inslee was unable to see anything but the fog. Suddenly, he heard the deep, resonant breathing of killer whales. A short time later, he caught sight of their dorsal fins, as the group of orcas swam near the boat. Inslee said the experience cemented his commitment to ensure that the sounds of orcas are never extinguished. The effort involves addressing the entire food web in the Salish Sea, solving problems of pollution, noise and many other issues. Last month, Inslee launched an initiative to protect the endangered killer whales of the Salish Sea by addressing the principal problems, including the need to restore threatened Chinook salmon, the primary food for the orcas. A lack of food has been linked to a decline in pregnancies and increased risk of disease for the orcas. The health of the food web is related to climate change, Inslee said, noting that the burning of fossil fuels puts carbon dioxide in the air and ultimately into the water. That increases the water’s acidity and dissolves the shells of tiny species eaten by fish and other marine creatures. It was disappointing when President Trump pulled the U.S. out of the Paris climate agreement, which was designed to reduce greenhouse gas emissions worldwide, Inslee said. But the good news, he added, was that “not one nation followed him” and at least 15 U.S. states have committed to addressing the climate change without federal help. The Salish Sea Ecosystem Conference, which continues Thursday and Friday, will include about 700 scientific presentations on topics ranging from habitat restoration to ecosystem management, from climate change to toxic chemicals. Like others at the conference, including speakers from local tribes, Jewell related stories about her personal connections to Puget Sound. “It is so good to be home,” declared Jewell, who headed the Department of Interior for more than three years under President Obama. Jewell grew up near Puget Sound, where she learned to kayak and sail, “which gave me a view of the Salish Sea that was extraordinary,” she said. Research focused on the Salish Sea is essential, Jewell said, but the effort must include respect for Native Americans who inherited a traditional knowledge and a unique perspective on the environment. Similarly, the views of long-time and even recent residents must be acknowledged, she continued, understanding that people have been making their living from natural resources for a very long time. Removal of two dams on the Elwha River was a major accomplishment, though it cost hundreds of millions of dollars, she said. Now, researchers can measure the ongoing improvements, as Mother Nature demonstrates how to restore a river. Government at every level is important, Jewell said, not only because of direct expenditures to support ecosystem restoration but also because incentives and rules can guide the direction of business. Jewell, 62, received a degree in mechanical engineering from the University of Washington and worked in the private sector for most of her life — first for the oil industry and then in banking, before becoming chief executive officer for Recreational Equipment, Inc., in 2005. Throughout her career, Jewell was active in various conservation efforts, including playing a key role in founding the Mountains to Sound Greenway Trust, which has acquired and preserved thousands of acres of forestlands in the Cascades. As Secretary of Interior, Jewell says she was guided by science to protect important fish and wildlife habitats as well as historical and cultural sites. She encouraged everyone to enjoy the national parks and other federal lands. Her “Every Kid Every Park” program offered a one-year free pass to national parks for all fourth graders and their families. A point of pride during her tenure was the effort to improve relations with Native American governments and to settle decades-long disputes over land and water resources. Having worked in both business and government, Jewell said it is far easier to work on the business side. Government requires cooperation among a variety of competing interests that can’t be totally satisfied. Businesses can work with government, she said, and they don’t normally mind following rules. They want a level playfield with regulations that stay fairly constant so they can innovate and compete against each other. After leaving government, Jewell completed a fellowship at Harvard’s Institute of Politics and is now associated with the UW School of the Environment. Inslee said government should recognize and encourage businesses that do good things for the environment. He mentioned how Microsoft created financial incentives for corporate vendors to provide low-carbon products. In answer to a question about managing state priorities with a limited state budget, Inslee said there are many critical issues, but some things cannot be delayed to another time, not even for a year. To save the Salish Sea, one also protects the forests, the streams, the air quality and even people’s health, he said.